NOTE: Picture shows comforter and other accessories. This is for the camouflage sheet set only. Twin Size Beds are generally 39 inches x 75 inches. The sheets fit most mattresses up to 13" deep. Comes as fitted sheet, flat sheet and two pillowcases (except twin which comes with one pillowcase). Enjoy sheet sets in various styles and colors. Unique designs and classic solid colors are available. Browse our categories to find the comforter set that fits your needs. Proudly made in the USA! Washing Instructions: Cool water temperature, no bleach. Always wash colors separately and before using. Dry on cool and remove promptly upon dry and fold at once for best results. SHIPPING TIME: 95% of our orders ship within 7-10 business days plus transit time. Some items may ship separately. 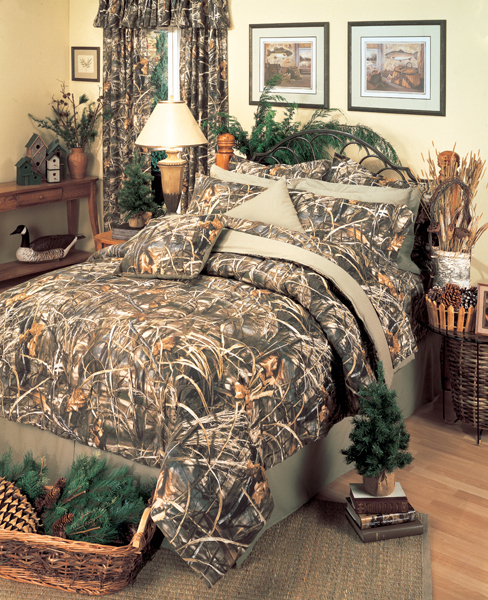 Enjoy camouflage sheet sets in various styles and colors. Unique designs and classic solid colors are available.